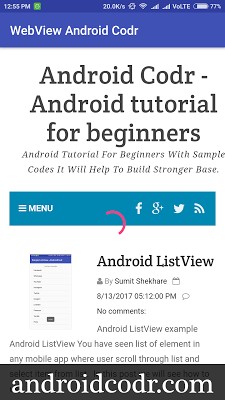 In this tutorial we will see how open url within app with help of WebView. this is used like custom browser. 4. 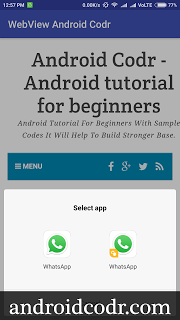 I used package path as com.androidcodr.webview click next. 9. 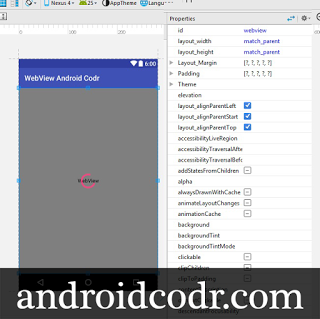 If you are having constrainLayout change it to RelativeLayout. 10. Delete Hello world textview. 12. We will add progressbar to know our web page is loading. and hide it when page is loaded completely. 13. add ProgressBar at the centre of webview. Here we set visibility gone. 16. Initialize in OnCreate Method. 18. now add url which you want to open in loadUrl method of webview as follow. 18. 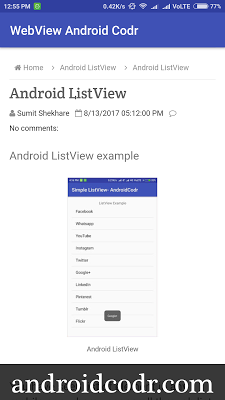 We will define Inner class and set it as WebViewClient to WebView. This class will overridefollowing method. this method is called when page is loaded completely. this method is called when user click on any link in web page. 20. To overried methods use shortcut as Ctrl+O on Windows. 22. same onPageFinished we will set visibility of progressbar to Gone. 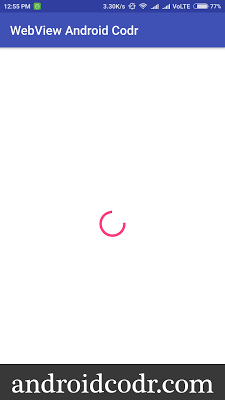 this will load within webview. if its other links View Intent will called. 24. At last we also need to handle the back button. so previous page will load. override method onBackPressed after mWebview class end. 25. Here we checked webview can go to previous page or not. super.onBackPressed() handled from AppCompact Activity class. now compile code and run app. we can see progressbar while loading. you can click on links new page is loaded. we can also go back to previous page. If you Like post share with your Friends. Subscribe us for new updates posts.